Last week we discussed a hidden gem of the tax code for C Corporations, Section 1202 Qualified Small Business Stock. This week, I want to discuss another significant tax savings of the tax code for C Corporation owners – Section 1244. IRC Section 1244 allows certain shareholders of Qualified Small Business Stock (“QSBS”) to treat losses on dispositions of QSBS as an ordinary loss rather than a capital loss. What the benefits of Section 1244? Net capital loss deductions are limited to $3,000 per year on your taxes. This means that if you have no capital gains but have $50,000 of capital losses, then you can only deduct $3,000. The remaining carries over to future tax years until used in full. Section 1244 losses are treated as trade or business loss. So, what does this mean? The losses can be deducted with or without other business income on your taxes. This also means that the loss can generate a Net Operating Loss, which can be carried back 2 years or carried forward 20 years. Net Operating Loss deductions are not capped like net capital losses. 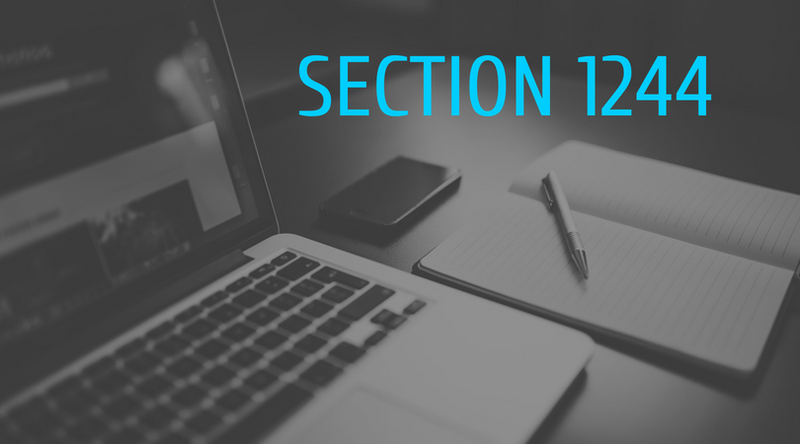 What are the limitations of Section 1244? The corporation for which you own stock must be a domestic small business corporation. This means that, when the stock is issued, the total amount of money and/or the adjusted basis of property received by the corporation for the stock must not exceed $1M (the value of services rendered to the corporation does not qualify and, in general, stock issued for securities does not qualify as well). The determination of the Section 1244 status is made each time new stock is issued by the corporation. Once the $1M value threshold is exceeded, the corporation designates the shares to be treated as Section 1244. You must be the original owner of the stock. The owner can only be an individual or a partnership. If a partnership owns the stock, the tax benefits “pass-through” to the partners via a Schedule K-1. The stock owned can be common or preferred stock but cannot be convertible stock. The corporation cannot be a holding or investment company. Lastly, the corporation must pass a gross receipts test. During the last five years ending before the date of the stock sale, the corporation must have derived more than 50% of its gross receipts from sources other than investment income, royalties, rents, annuities, and sales or exchanges of stocks or securities (in general, the company should be an operating company). There is an exception to the gross receipts test – if the cumulative deductions of the company exceed cumulative gross income during the five-year period (meaning, net losses for five straight years). The maximum amount of ordinary loss that can be claimed in a given year is $50,000 for single filers and $100,000 for MFJ filers. Any losses in excess of these amounts are converted back to capital losses and follow the rule mentioned above. How do I take advantage of this tax break? No election is needed to take advantage of this code section, you just need a tax advisor who is aware of this tax break and to ensure the full benefit against your taxes. Just like the Section 1202 Qualified Small Business Stock, this code section is very complex and also has a lot of “red tape”. If you have any questions about if your company qualifies, please feel free to contact me directly!